NEW YORK (CNNMoney) -- Rick Harrison knows a deal and a steal when he sees one. Ever since he was a young boy, he's had the uncanny ability to make money selling other people's unwanted items. Today, that ability has made him a mint and turned him into one of TVs hottest reality stars. The 43-year-old pawn shop owner has achieved a cult following as part of the cast of the reality show, ''Pawn Stars,'' on The History Channel. Along with his father, Richard "The Old Man" Harrison, his son, Corey "Big Hoss" Harrison" and family friend Austin "Chumlee" Russell, Harrison gives viewers a behind-the-scenes peek into his Las Vegas business the Gold & Silver Pawn Shop. In the process, he educates audiences on the history behind many of the unique items sold in the store. 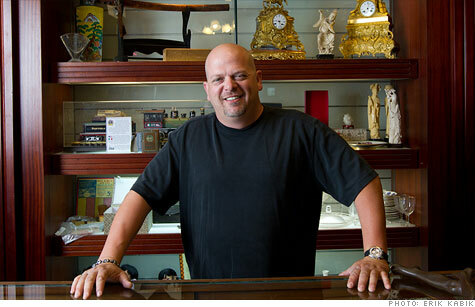 Debuting in 2009, ''Pawn Stars'' is now the History Channel's top-rated show, and one of the highest-rated shows on cable television, averaging 5 million viewers per week. This month, Harrison signed a new, record-breaking 80-episode renewal contract for four more seasons of ''Pawn Stars.'' He's also released his first book, ''License to Pawn: Deals, Steals and My Life at the Gold and Silver'' (Hyperion). So what's the secret to his success? Harrison shares his tips on finding fame and fortune. Here are edited excerpts from the interview below. Set yourself apart. As a small business owner with big competition, we had to figure out a way to be different. We saw an opportunity to invite people to sell their rare and unusual items at our shop, in addition to conducting our usual pawn business. Now, when the big corporate pawn shops get an item they don't recognize, they send the customer to us. " Know how to negotiate. Never fall in love with something when you're negotiating a price. Never decide you're going to buy something because you can't live without it. Negotiating to buy an item shouldn't be an emotional process. And you should never, ever, give the first number. As a buyer, you don't want to risk coming in first with a high price. Offer something no one else does. In the 90's, I went on eBay to buy some paddle tires for my four-wheeler ATV and couldn't find any. When I did find a manufacturer that sold them, I bought 20,000 and had no problem reselling them. So the next time you get mad when you can't find an item, realize there's a market waiting to be explored. Treat every customer well. I tell everyone that works for me not to look down on people. If you're nice to people and take a minute to talk with them, it's good for business whether or not they buy anything. Just because they don't look like they have money doesn't mean they're poor. Once an unkempt, elderly woman came into the pawn shop. She appeared homeless, and she insisted on seeing every piece of expensive jewelry in the store. Just when I was feeling impatient, the woman pointed at the most expensive piece of jewelry and said, "I'll take that one." Then she proceeded to pull $4,000 out of her sock to pay for it. Embrace social media. After ''Pawn Stars'' became popular, we began selling a lot of T-shirts and swag [promotional items] in the store. A year ago, I decided that rather than having our T-shirts professionally designed, we should hold a competition on Facebook and ask our fans for design ideas. For every design we choose to go on a shirt, the winner receives $250 and a box of swag. As a result, we're receiving hundreds of design ideas, and have saved over $100,000 on producing t-shirts." We also pay someone to do regular Facebook status and Twitter updates. Corey and Chumlee have been getting paid $1,000 a night to appear at different nightclubs. Club owners know that once they start tweeting their location for the night, hundreds of people show up to see them.